An old maxim applies, and, truly, they are words to live by: “If the car is good enough for Serge Gainsbourg to sing about, it’s good enough for the Gentleman Journalist to drive.” One of the only cars the beloved French singer-songwriter ever sang about was the Ford Mustang—a rolling piece of Americana if there ever was one. In fact, the ‘60s-era “Ford Mustang” exemplifies the American lifestyle and harkens back to a time when the French used to really like America. Was it really that long ago? Was there a time before Freedom Fries and the general Francophile disdain? If there’s anything that can lure the French to sing our praises again, it’s remains this car, especially now. 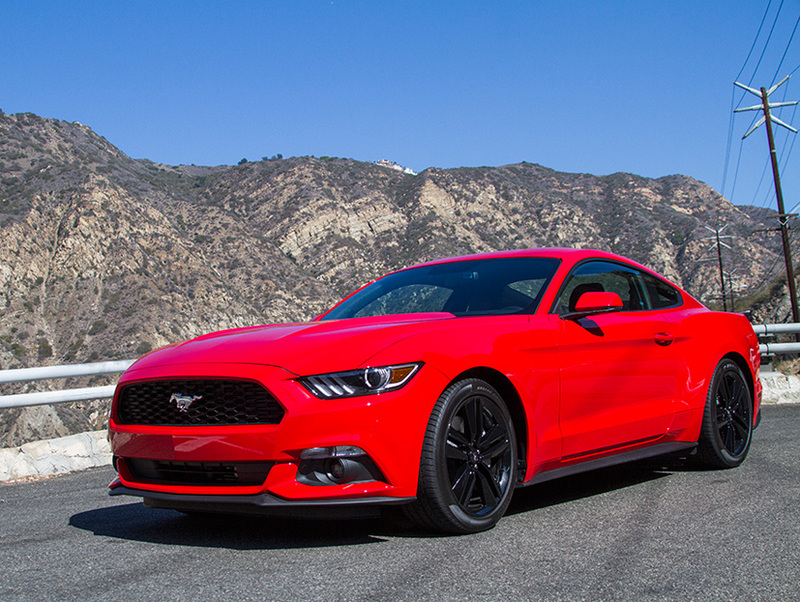 For 2015, the Mustang celebrates its 50th Anniversary and in honor of the legendary Pony car turning a half a century old, like a lot of middle agers and especially those in Los Angeles, a nip, a tuck and a full face lift is in order. But Ford did a lot more than a refresh, in fact it’s an all new model and the changes are much more than skin deep. Ford rolled out all the stops — new tech, new engines, a new rear independent rear suspension verses a solid axel (which may not seem like a huge deal but in fact is huge). Ford is finally making an attempt for the Mustang to appeal to not only the tired and true Pony car fanatics, but also a market that gives a resounding shrug when it comes to cars, those dreaded millennials. Ford is also trying to woo a global audience to the pony, which is a bit odd since the Mustang has been a U.S.-only model since time immortal. Regardless, the new ‘Stang is pretty dang great; it’s mean looking, with its long hood, big greenhouse and wide haunches and is the kind of car you can still imagine hitting the Sunset Strip on a Saturday night or a long drive up PCH. He’s right, the Mustang does typify California, especially with the GT model we drove. Lots of power from its 435 horsepower, 5.0-liter V8 engine, some mean race car looks and a top speed of 155 MPH all for a base price of $32,100, which isn’t a lot of coin to spend on a mid-life crisis kind of car. But it’s the $26,365 turbocharged 2.3-liter, 310 horsepower EcoBoost model that got us most jazzed as a turbocharged Mustang has been as rare as a hen’s tooth. Driving a Mustang with turbo lag takes some getting used to, but as emissions and fuel economy standards become more stringent, turbocharging is the way of the future. Also, the word Turbo is cool. The new 2015 Mustang is available to price and build on the Ford site and will be in dealer showrooms this fall, just in time for a holiday gift… I’m writing to you, Mrs. Gentleman Journalist.